Big Sleep Out Big Sucsess! Braving temperatures as low as 3°C, seven staff from Nottinghamshire builder Robert Woodhead Limited joined over 300 other hardy souls at the Big Sleep Out at the Capital FM Arena in Nottingham City Centre on Thursday 15 November. This annual event raises funds for Framework who works for homeless and vulnerable people across Nottinghamshire. The Robert Woodhead team has raised over £1000 for Framework, with more than £500 via sponsorship from staff, suppliers and customers as well as a further £500 from David Woodhead, Managing Director of Robert Woodhead Limited. 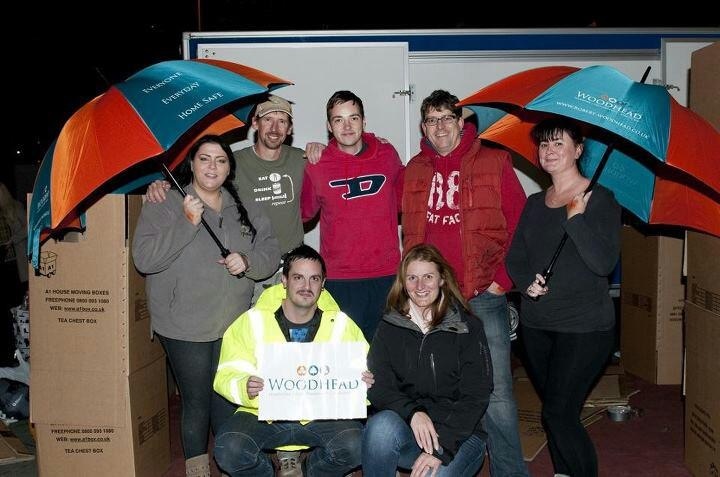 Those sleeping out for Team Woodhead were Mathew Hall, Glenn Slater, Tom Woodhead, John Guest, Jennie Guest, Sam Sargent and Kirsty Crossley. The event which started at 8pm on 15 November and finished at 6am on 16 November was a great success. In fact, it was one of the most successful ever. Framework Chief Executive Andrew Redfern said, “This event has been going in one form or another for the last 20 years – but we have never had a response quite like this.” Framework also run similar event in Mansfield each year, the Big Snore, which Woodhead also supported. Those sleeping out were entertained with live music, hot drinks and food as well as speeches from Framework. Capital FM’s Dino and Pete were on hand to award Team Woodhead the ‘Most Technically Advanced Shelter’ Award – quite fitting for a local builder. Robert Woodhead won a £100 voucher for a meal atNottingham’s Chino Latino Restaurant. They intend to raffle the prize off to add to their fundraising total. We will be producing a video diary of the Big Sleep Out. Check out the Robert Woodhead YouTube Channel in the next few weeks.